skill level ••• intermediate finished size instructions given fit woman’s small, changes for medium, large, x-large and 2x-large are in . finished garment measurements bust: 37 inches (small) [41 inches (medium), 45 inches (large), 49 inches (x-large), 53 inches 12x-large)] materials moda dea tweedle dee bulky • (chunky) weight yarn (31/2 oz /l55 yds/100g per ball): 3 [3,3,4,4] balls # 8906 cinnamon twist tlc essentials medium (worsted) weight yarn (6 oz/312 yds/170g per skeins): 1 [1,2,2,2] skeins #2500 teal 1 [1,1,2, 2j skeins #2821 paradise blue 1 [1,1,1,1] skein #2680 eden green sizes 1/9/5.5mm and j/10/6mm crochet hook or sizes needed to obtain gauge tapestry needle Sewing needle Sewing thread Buttons: 3/4-inch: 4 1/2,-inch: 3 21 [23,25,27, 28]-inch square denim fabric (see Pattern Notes) GAUGE Size I hook: 13 sc = 4 inches; 13 sc rows = 4 inches Size J hook: 11 sc = 3’3-3/4 inches; 11 sc rows = 4 inches Take time to check gauge. 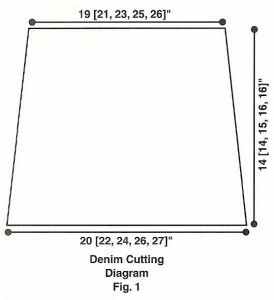 PATTERN NOTES Denim on item was cut from the thigh part of a pair of jean legs that has been sewn together in order to have seams as shown. Use size I hook unless otherwise stated. 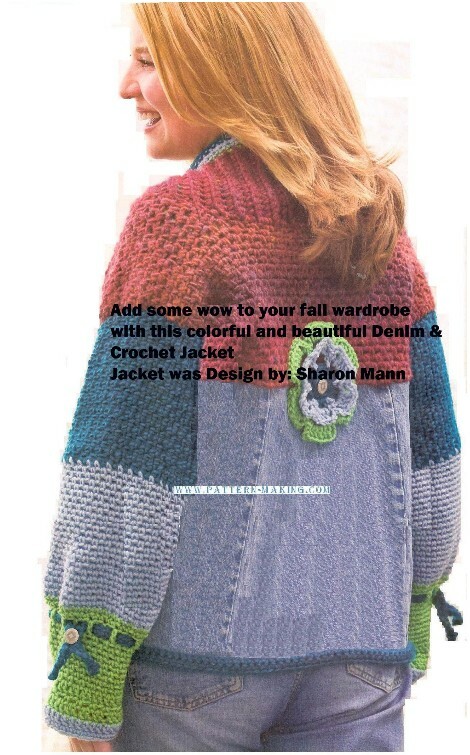 Chain-3 at beginning of row or round counts as first double crochet unless otherwise stated. JACKET Front & Neck Ribbing Row 1: With size J hook and cinnamon twist, ch 15 [17, 19, 21, 211, sc in 2nd ch from hook and In each ch across, turn. (14 [76, 78,20,20] sc) Row 2: Working in back Ips (see Stitch Guide), ch 1, sc in each st across, turn. Next rows: Rep row 2 until piece measures 52 [52,53,54, 54] inches from beg. At end of last row, fasten off. Front & Neck Border Row 1 (RS): Working in ends of rows across 1 long edge of front & Neck Ribbing, with size I hook, join green with sc in end of first row, sc in end of each row across, turn. fasten off. Row 2: Join blue with sc in first st, sc in each st across, turn. Row 3: Ch 1, sc in each st across, turn. fasten off. Row 4: Join teal with sc in first st. sc in each st across, turn. Row 5: Ch 1, sc in each of first 24 [24, 28, 30, 30] sts, sk next 2 sts, [sc in next st, 2 sc in next st] across to last 24 [24, 28, 30, 30) sts, sc in each st across, do not turn. fasten off. Row 6: With RS facing, join teal with sc in first st, sc in next st, ch 3, sk next 2 sts (buttonhole), sc in each of next 5 sts, ch 3, sk next 2 sts, sc in each of next 6 sts, ch 3, sk next 2 sts, sc in each of next 5 sts, ch 3, sk next 2 sts, sl st in next st, leaving rem sts un-worked. fasten off. Sew buttons to Ribbing opposite buttonholes. Front Make 2. Row 1: Starting at bottom edge, with size J hook and cinnamon twist, ch 15 [17, 19,21,21], sc in 2nd ch from hook and in each ch across, turn. (14 [76,78,20, 20] sc) Row 2: Ch 1, sc in first st, [ch 1, sk next st. sc in next st] across, sc in last st, turn. 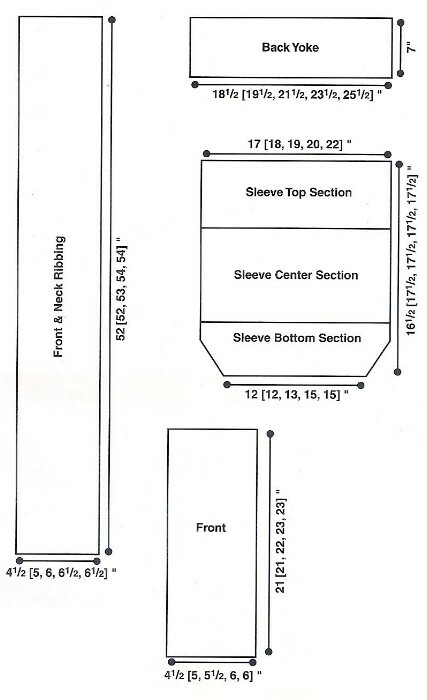 Next rows: Rep row 2 until piece measures 21 [21,22,23,23) inches from beg. At end of last row, fasten off. Matching bottom edges of long edges of fronts to un-worked long edge of front and Neck Ribbing, sew tog leaving 10 [10, 9,8, 8J inches at center back un-sewn for Back Yoke. Front, Bottom Edging Row 1: Working in starting ch on opposite side of row 1, join teal with sc in first ch, sc in each ch across front and in each st and in ends of rows across front & Neck Edging, turn. Row 2: Ch 1, sc in each st across. Fasten off. Rep on rem Front. Back Yoke Row 1 (RS): Working across top edge of Fronts and in ends of rows on un-worked section of Front and Neck Edging, with size J hook, join cinnamon twist with sc in first st on Front, evenly sp 53 [55, 61, 67, 73] sc across, turn. (54 [56,62,68, 74] sc) Row 2: Ch 1, sc in first st, [ch 1, sk next st, sc in next stl across, sc in last st. turn. Next rows: Rep row 2 until piece measures 7 inches from beg. At end of last row, fasten off. 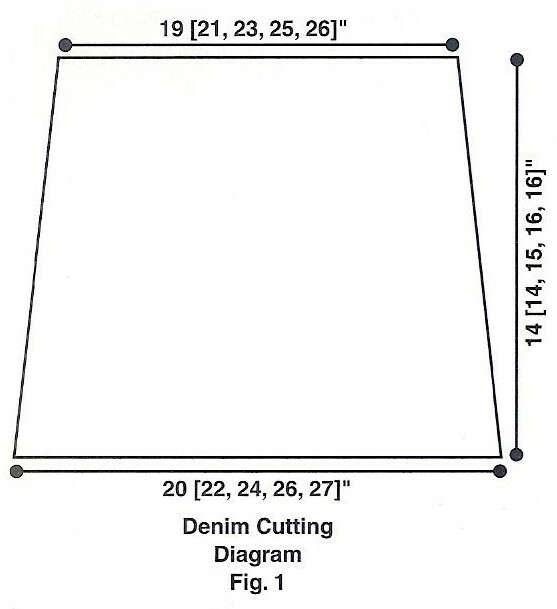 Denim Cut denim according to Denim Cutting Diagram (see Fig. 1). Allowing 1/2, inch for hem, hem around the outer edge. Sew Back Yoke to top edge of denim. Denim Bottom Edging Row 1: With teal, make ch to fit across bottom of denim, sc in 2nd ch from hook and in each ch across, turn. Row 2: Ch 1, sc in each st across. Fasten off. Sew Denim Bottom Edging to bottom edge of denim. Sleeve -Make 2. Top Section Row 1: With teal, ch 21, sc in 2nd ch from hook and in each ch across, turn. (20 sc) Row 2: Ch 1, sc in first st, [ch 1, sk next st, sc in next st] across with sc in last st, turn. Next rows: Rep row 2 until piece measures 16 [17, 18, 19, 21] inches from beg. At end of last row, fasten off. Fold piece in half widthwise. Place fold at shoulder seam and sew in place. 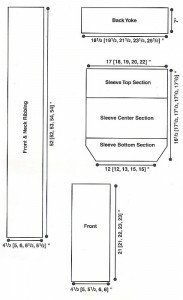 Sew Sleeve seam. Sew side seams. Center Section Rnd 1: Now working in rnds and in end of rows of Top Section, join blue with sc in seam, ch 1, evenly sp [sc, ch 1] 54 [56, 60,62, 66] times around, join (see Pattern Nates) in beg se. (55 (57,61,63, 67] sc) Rnd 2: Ch 1, sc in first ch sp, ch 1, sk next st, [sc in next ch sp, ch 1, sk next st] around, join in beg se. Next rnds: Rep rnd 2 until piece measures 12 inches from beg. At end of last rnd, fasten off. Bottom Section Rnd 1: Join green with sc in first ch sp, sc in each ch sp and in each st around, join in beg se. (55 [57, 61, 63, 67] sc) Rnd 2: Ch 1, sc in first st, sc in each st around and at the same time, evenly sp [sc dec, (see Stitch Guide) in next 2 sts] 15 times, join in beg se. (40 [42,44,46, 48] sc) Rnd 3: Ch 4 (counts as first dc and ch-l), sk next st. dc in next st. [ch 1, sk next st, dc in next st] around, join in 3rd ch of beg ch-4. Rnd 4: Ch 1, sc in first ch sp, ch 1, sk next st, [sc in next ch sp, ch 1, sk next st] around, join in beg se. Next rnds Rep rnd 4 without joining, mark first st of rnd, until piece measures 2-1/2 inches for where this color beg. Next rnd: Ch 3 (see Pattern Notes), dc in next ch sp, 2 dc in each ch sp around, join in 3rd ch of beg ch-3. Next rnd: Ch 1, sc in first st. ch 1, sk next st, [sc in next st, ch 1, sk next st] around, join in beg se. Next rnd: Ch 3, dc in next ch sp, 2 dc in each ch sp around, join in 3rd ch of beg ch-3. Fasten off. Next rnd: Join blue in any st, ch 3, dc in each st around, join in 3rd ch of beg ch-3. Last rnd: Ch 1, sc in each st around, join in beg se. Fasten off. . Sleeve Ribbon Row 1: With teal, ch 50 [53, 55, 57, 59], sc in 2nd ch from hook and in each ch across, turn. Row 2: Ch 1, sc in each st across. Fasten off. Weave Sleeve Ribbon through ch sps on rnd 3. Overlap ends and sew ½ inch button through both pieces at overlap. Flower Rnd 1: With teal, ch 6, join in first ch to form ring, ch 3, 11 dc in ring, join in 3rd ch of beg ch-3. Fasten off. Rnd 2: Join blue in first st, [ch 5, sk next st, sc in next st] around ending with ch 5, sk last st, join in joining slst on last rnd. Rnd 3: Ch 1, sc in first st, *(sc, ch 3, 3 dc) in next ch sp, ch 3**, sc in next st, rep from * around, ending last rep at ‘”. join in beg sc. Fasten off. Rnd 4: Join green in back bar (see Fig. 2) of first sc, ch 7, [sk next st, slst in back bar of next sc, ch 7] around, join in beg sc. Rnd 5: 51st in first ch sp, ch 3, (5 dc, ch 3, sl st) in same ch sp, (sl st, ch 3, 5 dc, ch 3, slst) in each ch sp around, join in beg 51 st. Fasten off. Sew Flower to Back, centered over Back Yoke and denim fabric. Sew ½ inch button in center of Flower.